Passy Muir offers an assortment of accessories to facilitate the use of the Passy Muir® Valve in a variety of applications. Not sure which accessory best fits your Valve or ventilator?  See our Accessories and Connections Guide, click here. The PMV® is a prescription device and requires an order from a medical doctor. For more information on how to order, click here. The PMA 2000 Oxygen Adapter is a small, lightweight adapter designed to deliver low-flow oxygen (up to 6L/min) to the face of the Passy Muir Valve. It easily snaps onto the PMV® 2000 and PMV® 2001, providing a portable and comfortable method of delivering low-flow oxygen to patients with tracheostomy. Latex free. Made in the USA. The PMA 2020-S Adapter is required to attach the PMV® 2020 to a metal Jackson Improved tracheostomy tube. This package of 3 adapters provides additional adapters in case of damage or loss of the original adapter packaged with the PMV 2020. Latex free. Made in the USA. The PMV AD1522 Step-down Adapter (22mm I.D., 15mm O.D.) provides clinicians with a way to easily connect the Passy Muir Valve in-line while the patient is mechanically ventilated. Color coded for use with the PMV® 007 (Aqua Color™), the adapter provides a secure connection between the Passy Muir Valve and ventilator tubing, closed suction systems, or other adapters. Provided in a resealable package of 5 units. Conforms to ISO 5356-1. Latex free. Made in the USA. What is a Passy Muir Valve? Invented by a patient named David Muir, the Passy Muir Valve is a simple medical device used by tracheostomy and ventilator patients. When placed on the hub of a tracheostomy tube or in-line with the ventilator circuit, the Passy Muir Valve redirects airflow through the vocal folds, mouth, and nose, enabling voice and improved communication. 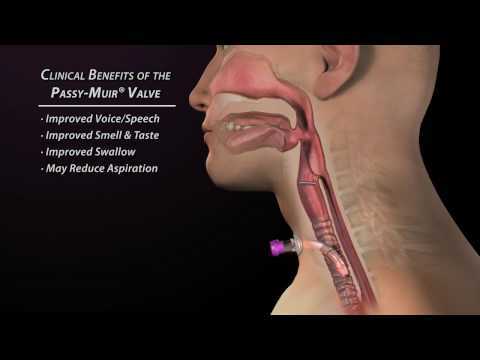 Years of evidence-based research has shown that the Passy Muir Valve offers patients numerous clinical benefits beyond communication, including improved swallow, and secretion management. The patented no-leak design of the Passy Muir Valve means that the Valve is always in a closed position until the patient inhales. The Valve opens easily with less than normal inspiratory pressures and closes automatically at the end of the inspiratory cycle without air leak and without patient expiratory effort. Unlike open position speaking valves, the bias-closed position Passy Muir Valve allows the patient to create positive airway pressure and restores the patient to a more normal closed respiratory system. The closed system also creates a protective column of air in the tracheostomy tube which resists secretions from moving up the tube and occluding the Valve. Instead, secretions may be coughed up around the tube and expectorated or suctioned from the mouth. All Passy Muir Valves have a bias-closed position no-leak design that restores a closed respiratory system. 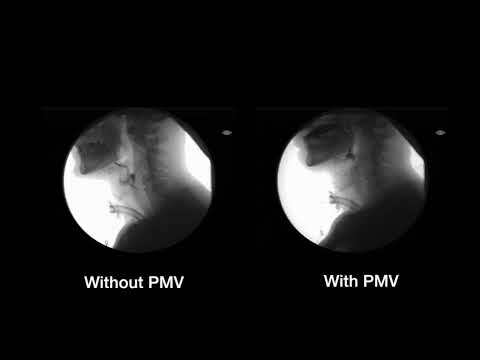 Sample thin liquid swallows from Videofuoroscopy demonstrating the effect of PMV use. On the left is the patient’s swallow without a Valve, and the right is following Valve placement. Sample from a FEES Study conducted by Liza Blumenfeld, MS, CCC-SLP showing a patient’s baseline study and then day four change, following dysphagia treatment while using the PMV. The bias-closed position, no-leak Passy Muir Valve design restores a more normal closed respiratory system, which allows the patient to create positive airway pressure without the need for manual occlusion of the tracheostomy tube. This promotes louder voice, improved swallow, stronger cough, and may increase oxygenation. Tracheostomized and ventilator-dependent patients can produce clearer voices with more normal phrasing, better vocal quality, and increased volume because all exhaled airflow is redirected up past the vocal folds. The bias-closed position, no-leak design of the Passy Muir Valve can improve the safety and efficiency of swallowing and may reduce aspiration. 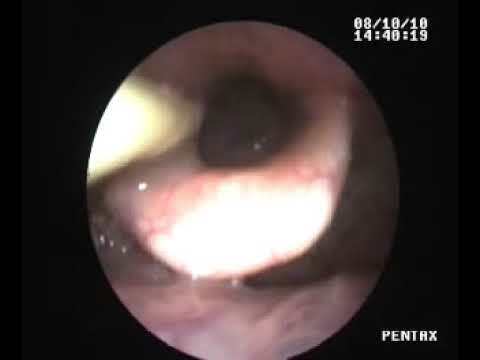 The bias-closed position Valve restores the patient to a more normal closed system which facilitates increased pharyngeal and laryngeal sensation and restores positive subglottic air pressure. Only the bias-closed position, no-leak design of the Passy Muir Valve reestablishes a closed respiratory system and restores subglottic pressure, which improves swallowing and may reduce aspiration. Adult, pediatric, and neonatal patients on the ventilator may utilize the Passy Muir Valve during mechanical ventilation. All Passy Muir Valves are interchangeable (except the PMV 2020) and can be used both on or off acute-care and portable ventilators. Passy Muir Valves are used as an augmentative tool for weaning patients from the ventilator as it reestablishes physiologic PEEP, which in turn may improve oxygenation. As the patient becomes accustomed to exhaling through the upper airway, patient confidence is improved and respiratory muscle retraining is facilitated. Passy Muir Valves may be used as an interim step in the decannulation process by allowing the patient to begin to adjust to a more normal breathing pattern through the upper airway on exhalation. This allows the patient to gain confidence and the physician to assess for airway patency and can significantly shorten the decannulation process. The bias-closed position, no-leak design of the Passy Muir Valves restores a more normal closed respiratory system. As a result, Positive End Expiratory Pressure (PEEP) is reestablished which may facilitate improved oxygenation. Passy Muir Valves improve the sense of smell by re-establishing airflow through the oral and nasal cavities during exhalation. This improved sense of smell may lead to an increase in sense of taste, appetite, and caloric intake, which are all important in the recovery process. The bias-closed position, no-leak design of the Passy Muir Valve facilitates secretion management as it re-establishes a closed system that enables the patient to produce a stronger, more effective cough and improves swallowing due to restored positive subglottic pressure. It also facilitates evaporation of secretions due to the redirection of air through the upper airway during exhalation. As a result, suctioning needs may be reduced. The Passy Muir Valve eliminates the need for finger occlusion of the tracheostomy tube, which may help prevent infection and offers protection from particulates entering the trachea. The Passy Muir Valve redirects secretions through the upper airway, allowing oral expectoration and reducing contamination of the patient’s immediate environment. All Passy Muir Valves, except the PMV 2020, can be used both on and off the ventilator with both pediatric and adult patients. This includes patients with a tracheostomy only, patients who are weaning from the ventilator, and patients who are ventilator-dependent. The Passy Muir Valves can be placed in-line with the ventilator using disposable tubing (with PMV 007 only) or with the PMV-AD22 Flexible Silicone Adapter (with PMV 005, PMV 007, PMV 2000 and PMV 2001).